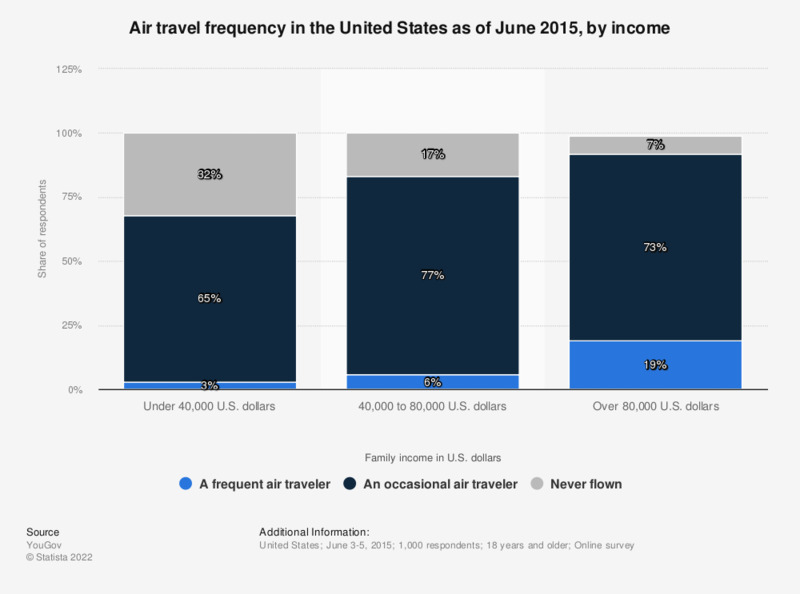 This statistic shows the air travel frequency of citizens in the United States as of June 2015, by family income. During the survey, 19 percent of respondents with a family income of more than 80 thousand U.S. dollars labeled themselves as frequent air travelers. Statistics on "Airline travel in the United Kingdom (UK)"
How often do you travel by airplane (business or leisure)? When you fly, which types of flights do you take? Are you a member of a frequent flyer program? How long did you queue when waiting to be security screened? How closely have you been following the news that airport screeners missed 95 percent of banned items, such as explosives and weapons, that were smuggled through as a test by government agents? Do you think the passenger screening procedures that you saw the last time you flew were too tight or not tight enough? During your most recent experience going through airport security, did you personally receive, or did you see others receive a full body pat down?